Spot Prices once again show a bearish trend due to the continued warmer weather and a low consumption forecast. In terms of supply the improved nuclear availability in France and higher lignite production in Germany may have an effect on prices although wind output is expected to drop considerably over the next few days. Day-Ahead fell by 1.90ppt as the prompt gas contracts continued to make losses, Front-Month also shed 1.35ppt. On the Far-Curve all of the future contracts saw a fall in price apart from Summer-14. Storage levels rose above 10% as supply looks healthier by the day for the time being, extra LNG shipments played their part in the price drops despite the fact the weather is set to turn colder over the weekend. Prompt power contracts and future contracts made losses showing a similar trend to the gas curve. Day-Ahead fell by £2.25/MWh and closed at £47/MWh; decreasing carbon prices and a week of warmer weather were the main factors in these losses. Day-Ahead gas made a loss of 0.25ppt day-on-day this morning and opened at 64.75ppt while the Far-Curve also had a bearish outlook. The additional LNG send outs from the South Hook LNG terminal have resulted in an over-supplied system with UK stocks still above 10%. The prompt market made losses with Day-Ahead and Front-Month decreasing by 0.75/MWh and £0.30/MWh respectively. 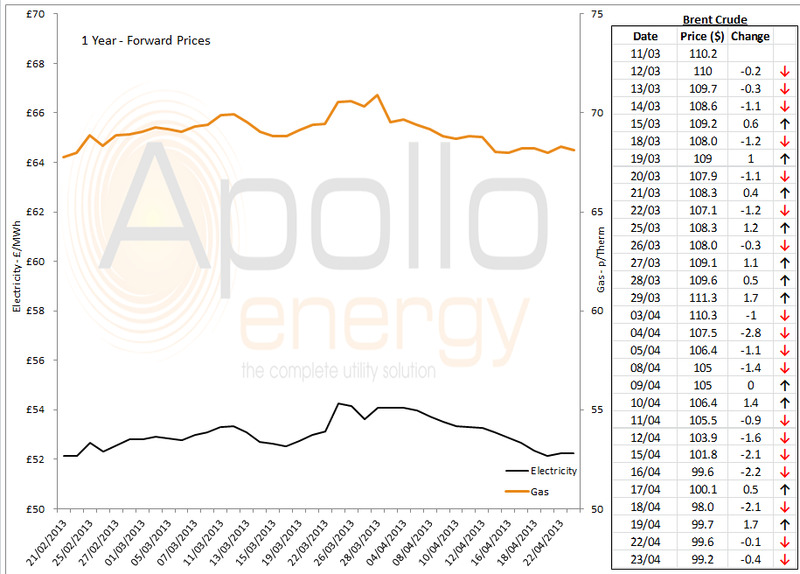 The Far-Curve showed little change even though APi2 Front-Month coal fell by $1.4/tn and carbon allowances making a drop due to the EUA spot price reaching â‚¬2.84/tn. Market close data has revealed that the 1-year forward price for commercial gas made a small loss and commercial electricity kept its price - closing at 68.10ppt and £54.85/MWh respectively. This can be seen in the graph below. Brent prices currently stand at $99.25/bbl after hitting a high $101/bbl as the oil market remains firm.